Tomorrow is May 1st, 2012: International Worker’s Day. And unless you have been living in a cage or other planet, tomorrow is also the day where the Occupy movement is organizing a general strike action across the 125 cities in the USA. This is organized by the 99%. In the UK however, the “97% Owned” investigates behind the scenes of the ever changing financial system, to uncover how the monetary system provides the foundations for international dominance and national control. Fresh thinking, new ideas and answers to simple questions are squeezed into this 2hr 10minute expose. Due for release May 1st it features frank interviews and comments from Positive Money, The New Economics Foundation, PRIME, Paul Moore HBOS Whistle Blower, Simon Dixon of Bank to the Future and Nick Dearden from Jubliee Debt Campaign. 97% owned is from the creative team behind Generation OS13: The New Culture of resistance, continuing the distinctive ‘tour de force’ style and artistic interpretation. Not that i subscribe everything that is said in this video – but i want you to sense the intensity and aggressivity of this movement. It reminds me a lot of what happened in 1977 with the punk movement, or the Flower Power 60’ies, but these were softer more “Peace no War”. This is getting much more confrontational. Check also the comments, as clearly not everybody agrees with the content, the quite tendentious language and music. This resonates strongly in me, see also my latest posts, many of them related to my reflections on what i was meant to be in this world. His thinking about value is very close to Art Brock‘s ideas on the Living Ecosystem of Wealth (check out www.metacurrency.org). In Art’s model, it’s becoming crystal clear that the majority of investments are purely speculative in nature, and don’t return any value back into the economic system. At the end, he also talks on how to change the rules, in essence by training and planting change agents virally in all financial institutions. Sounds familiar to our Corporate Rebels approach where we’d like “to ensure that true change happens virally”, although we are not targeting any specific industry. Starts crystalizing for me that what Corporate Rebels needs to change is to make our organizations more agile, more fit, more vital, more resilient in creating value rather than extracting value. Now i know why i once read Cradle to Cradle by William A. McDonough (Amazon Affiliates Link) why once again it’s an architect who inspires me. Because it and i was meant to be. Simon Dixon will launch his own initiative “Banks To The Future” in 30 days or so, as an alternative to bring money to the business without venture capitalists and banks involved. Another example of “First they ignore you, then they laugh at you, then they fight you, then you win” (Mahatma Ghandi), our theme for last week’s Innotribe in Bangkok. Simon Dixon looks to me a as good candidate for #innotribe #sibos for the session on “Future of Money”, don’t you think so ? And maybe we should be re-baptise that session into “Future of Value” ? I am restless these days. Exploring my limits, physically and mentally, and calibrating and navigating what I was meant to be: an architect, painter, scripter, dramaturge, producer? Experiences that matter, those touch and move you. 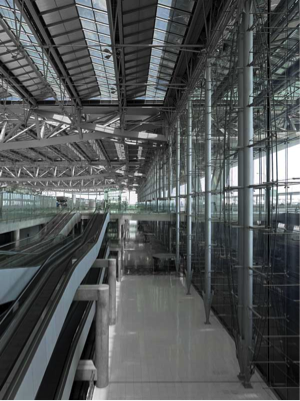 Experiences that give you the same sort of “bang” as when you arrive in Bangkok airport, and get amazed by the post-industrial architecture, in all it’s grandeur and massivity. The sort of “awe” when discovering Bucky, or the mindset of Jeffrey Katzenberg,Co-founder and CEO of DreamWorks Animation SKG here below in interview with David Kirkpatrick of Techonomy. The sort of “yes” when seeing the Blue Man Group. But a Blue Man Group with a message, and not only one-way, but where also the audience has to participate to realize the full potential and learning of the production. The sort of “love” and being “moved” when seeing/hearing Mark Pesce analyzing and synthesizing, and story telling with an eruditeness seldom witnessed before, with us at Innotribe Bangkok last week. When as an audience you know, just know, that this production is so right I, in the sense of “exact”, “spot-on”. When as a producer, behind the scenes and behind the technical desk, you can feel the shiver down the spine as the rumble of the deep bass rolls-in and when the show begins, and the mystic of the lights, the mystery of the colors, the artists, the perfect technology, the professional crew are all coming together in an amazing whirlwind. A production that feels more like a good book, where you have to invest in the beginning, where you discover new stuff, not the same old re-mashed hyped stereotypes, tricks and banalities. Like a great film where the plot unfolds, and magic and surprise come together. With deep immersive learning experiences, and drama, lots of drama, even in the sense of theatrical overacting. It’s creating a meta-story, a story of stories and adding performance to it. A new class of story telling, of immersive learning experience. 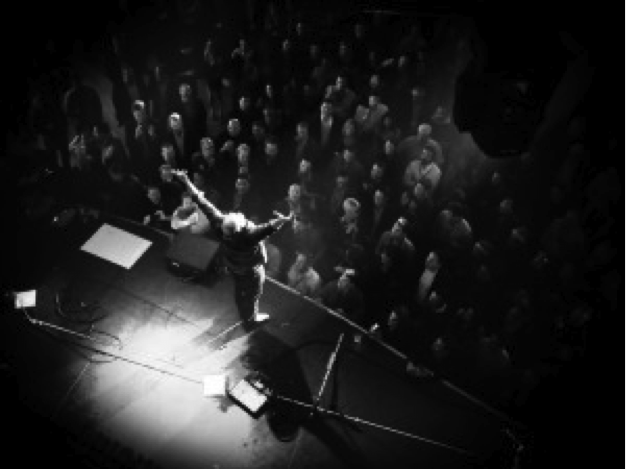 With authentic, inspiring mastery on stage, orchestrated and mashed-up into a brand new value play artistry, adding facilitation and superior crowd control to the mix. Aah! How I love the “stage” with it’s smell of wood, nails, pain, curtains, mechanics, flight-cases, racks, amps, cables, light and sound towers. The whole discussion of hyper-connected companies during our Innotribe event in Bangkok, and especially the story of Uber taxi, made me reflect deeply on the role of the old taxi company as a dispatching service. A dispatching role that was in essence the friction in the system, and becoming completely obsolete when the nodes (in this case taxi drivers and their customers) started talking to each other via API’s (in this was built into iPhone apps). This friction (less)-rule not only applies to organizations and functions but also to people and events. The master of ceremony (MOC) role has to become much more than just announcing and introducing speakers. If the MOC role stays limited to that, the MOC becomes a friction in itself that needs to be removed. The MOC has to become a “master of connections”, bringing additional content-value, interpretation and guidance to the mix. In the case of events, we have to start looking at them as a way to bring the consumers and providers of our immersive learning experiences in direct P2P contact through API’s aka “emotional synapses” of the speakers/ignitors. Some folks out there claim that we are pushing the envelope of performance too far, and should fold back to simpler formats closer to TED, or that our banking audiences and cultures are not ready for this. I deeply disagree. I believe that what we set out as a performance design in Bangkok is just the beginning, the middle of a spectrum between minimum and maximum. It is of course easier, less complex, where you just program some cool people and surf on the success waves of others, never creating something yourself. But when an event becomes a happening with no file-rouge, no overall theme, without gluing metaphor and design, and without deep reflection about the overall energy and thematic rhythms, then we end-up merely with a set of sequentially ordered speakers, at best a mash-up of speakers, MOC, and facilitation tricks picked from the routine shelf, where the colors and scribes are just lipstick on a pig, a weak copy of the original. It’s like cheating your audience. Because you know you can do so much better. Not giving the best of yourself is a cheating your audience, whether that audience is your beloved one, your family, your team, your company, and your world. Easy is easy. Easy smells laziness. What we – at least me – are trying to do with events is not about producing a soap, or the n-th well produced game-program for points or money on television. Although I can be seduced by a well executed professional television production like “The Voice”. I don’t want to go “easy”, that’s not where I set my bar. When “going back to basics, to easy” starts showing its ugly head, it’s time for us not to be complacent and run on routine, but to re-invent ourselves. We have to re-invent ourselves when we think we have explored the limits. I am looking for the French quality of “profondeur” which I find richer than “depth”. That is where I want to go. Sometimes, it looks like the ecosystem I live in today is not ready for this ambition and experiences. Sometimes, my current fishbowl is not ready to follow. I sense it’s a matter of time before we all can see the perspective. This minor headwind is no reason to give-up or scale-down. I want this “giving-my-best-experience” to happen rather sooner than later. I don’t think I can do more than one production like this per year or even two years if I want to keep the quality of content and production I have in mind. We have to keep our edge of “Edge-Walkers”, “Protagonists”, “Corporate Rebels”: challengers as described in Art Kleiner’s “The Age of Heretics”. Instead of being slightly better than everybody else in a crowded and established field, it’s often more valuable to create a new market and totally dominate it. Creative people don’t follow the crowds; they seek out the blank spots on the map. Creative people wander through faraway and forgotten traditions and then integrate marginal perspectives back to the mainstream. Instead of being fastest around the tracks everybody knows, creative people move adaptively through wildernesses nobody knows. Maybe I should disappear for some months or years, to do my ultimate research, find sponsors, leverage the knowledge of the commons, produce and distribute with the best of the best. I am restless. Because I feel I am stagnating in my current environment. Limited in my creativity. I want to break free. Unchain my heart. Being able to speak free again. No strings attached. Surprise you and myself. Explode, and be emotional and physical again. Exploring my limits. For what to do next, you are always on yourself. On March 11, 2012 Bruce Cahan and team organized TEDxNewWallStreet. At that event i did a talk titled “FinOlympics”. We are in the Olympic year 2012 after all, right ? The talk is a consolidation of my latest thinking on innovation. It is an 18 min story about babies as a metaphor for ideas, sandboxes for experimentation and incubation. The babies story is about the process of innovation. The process is complemented by the soul of innovation: the typical characteristics of innovators and disrupters. That section includes the basics of Corporate Rebels United. 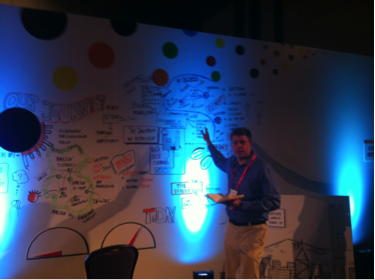 The inspiration for that section came at the Sandbox conference in Lisbon in January 2012. The Digital Asset Grid (DAG) is a salient example of a SWIFT Innotribe Incubation project. It is one of the more forward looking projects, where we not only look ahead in time, but also ahead in levels of abstraction and disruption. I condensed my latest thinking on DAG in a post titled “The Programmable Me: we are all nodes in the grid”. At the end of this talk, there is a call for creating an experimentation sandbox for Financial Services in Silicon Valley. You can also check-out the my different Prezi’s on each of these topics here. Enjoy! From time to time I get a mail with encouragements for my work at SWIFT and my work on the edges like “Rebels”. Today was one of those days. This is why I keep doing what i do. Below a letter from an anonymous reader of my blogs and tweets; a nice wrap-up of some of my latest work and efforts. At least it paid off for one person. I reproduced the mail without changing one letter. I just added the links where appropriate. Thanks for sharing your world in the links you provided. I love what you’ve done with the Innotribe channel on YouTube. Great style and excellent testimonials. Also looked at the Prezi presentations. Outstanding. I particularly liked the digital asset grid and the notion of a spectrum. I think the digital identity element coupled with a digital asset perspective is key to the next stage of digital development. I also like the services model you present at the end — like the perspective of both an enterprise and a customer or individual perspective and call for action on it and suggest some solutions. I too came to a similar conclusion that the power of identity is key and that it can be viewed as an exchange between the individual and other parties. Great work, Peter. I have attached two papers that I wrote with colleagues some time ago that explore what we called pervasive personal identity and a second paper on alternative security viewpoints (atomistic view — which is really an asset view). Totally agree with your From To perspective on security. Also very intrigued with notion of SWIFT playing a role in this space. We need some trusted players in this space that are not simply motivated by big data and commercial interests (e.g. Facebook, Google etc. “Everybody wants to replace me with my data. Your experience in Belgium also, in my opinion, can provide a leadership role on the global scene. I would like to see more told about that story. Love the “Babies” presentation. Fan of the Diogenes quote. Informative and energizing. And I would say the soul of innovation is a tour de force. Uplifting, emotive and a powerful message. I very much like the juxtapositions of art, science, psych, esthetic, and experience. Also a fan of B. Fuller. Thanks for sharing. Made my day. You also gave me additional motivation to get on Prezi. Have a great time and much success in Bangkok and Sydney. Thank you (x) from deep in my heart. You know who you are. It gives me a boost of energy for next weeks Innotribe in Bangkok. After our busy Asian week with our Innotribe Start-Up Challenge 2012 in Singapore, and the Innotribe event for Corporates in Bangkok, SWIFT and Microsoft are bringing Innotribe to Australia for the first time, with a half-day event built around an energizing mix of new perspectives and provocative thoughts. Through a series of deep conservations ignited by influential thinkers, participants will be able to learn from each others’ opinions, ideas and perspectives. 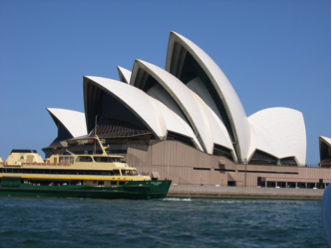 Innovation in Australia’s financial industry is a hot topic in 2012, with much of the focus on innovation in the payments system itself. But what of the relationship between banks and their customers? What about the proliferation of connected, aware mobile devices? What about the rise of trusted social networks and the consumerisation of IT? Are we living in the age of the customer? What does the emergence of a new generation of banks, virtual currencies and digital wallets mean for the future of money? How can we leverage digital identity, your digital footprint and a digital asset grid to empower consumers? How will businesses capture this potential and survive the dramatic business model shifts they will likely experience as this future becomes a reality? 09:30 – 10:30 Innovation provocations Subthemes: the emerging collapse of paper currencies, levels of disruption and financial services. Innotribe Sydney will be held on 8 May 2012 in the Microsoft offices, 1 Epping Road, North Ryde NSW 2113, Australia (Sydney). Looking forward to meet some of our Aussie tribe members in real life. @petervan from the Innotribe team. Cross posted on the Innotribe Blog. The last couple of weeks I have been aroused with many ideas and reflections on Personal Digital Assets and on Digital Assets in general. The journey started some weeks ago with my prezi talk at TEDxNewWallStreet and included my participation to the WEF “tiger team” on Personal Data, where a group of 30 experts are looking at what is needed to make realize the vision of Personal data as a new economic “asset class”. Personal data created by and about people, touching all aspects of society. That group is stitching the pieces together for a framework of business, technical and legal elements that are needed to underpin this vision. However, the following video from Kynetx was the big aha-moment during my 4-weeks tour on the subject. I never thought of a Personal Data Store as a “Personal Event Network”. indeed as Phil Windley (@windley), CTO of Kynetx says. One years ago, there was this beautiful video animation by David Siegel (@pullnews), a great vision of distributed nodes of personal data content talking to each other through API’s. In the meantime, there is a rich ecosystem of start-ups that are building something very similar as we speak. Maybe not yet to its fullest grand vision, but definitely going way beyond the traditional concept of a “personal data store”. Now there is the “event-signal”. It does not ask for something, it just says “something’s happened”, and any entity in the network can subscribe to the event and decide itself to do something with it. The other aha-moment was when Phil was doing his talk at the New Digital Economies conference on 27 March 2012. For those who remember, in the past we had silo-d email systems. 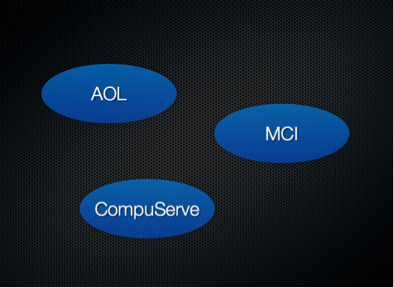 AOL, Compuserve, etc. They did not interoperate. 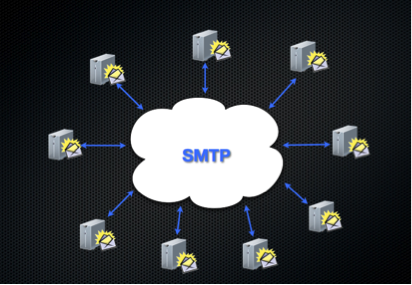 We got rid of those silos when there was a standard protocol, allowing competing commercial and open source servers to talk to each other in SMTP. We now see the same with data, personal data, social graphs. We have data-silos (Facebook, Google, Bank systems, Health systems, Government systems, etc). What we need is a “Data-Server” and a “Protocol” that allows these data servers to be interoperable. All this, Phil calls “The Live Web” (Amazon Associates link). He is so excited about this that he has written a book about it. And it can talk to any entity, any node in the web (or at least nodes in any discoverable namespace). In real-time. In multiplexing mode (meaning the node can be both a server and a client). 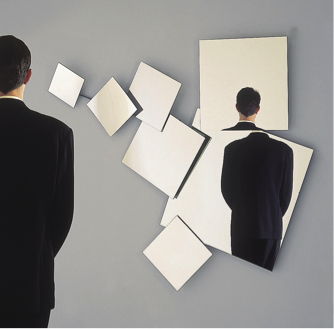 It suddenly dawned to me that over the last years we have been hyping “The Programmable WEB”, and that if we are serious about customer centric identity or “customer centric” or “personal” whatever, we may wish to start with the “me”. “Me” is becoming a node in the grid. We are all nodes in the grid, sending and receiving signals. Like neurons passing an electrical or chemical signal to another cell. And start thinking “synapses” when you talk about the API’s of your Programmable Me. The APIs of your “Programmable Me”, of your Personal Event Cloud are indeed the means to make all these nodes interoperable. Each circle in this drawing represents a node in the grid. 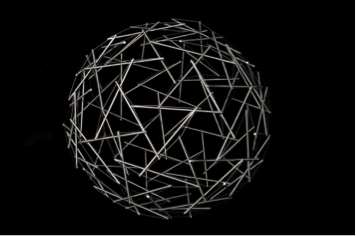 I really encourage you to look at this as a graph – this ensemble of inter-connected nodes – as something 3-dimensional, possibly multi-dimensional. We have all been trained to think hierarchical. Flat files with a root, that sort of thing. We have to learn to think in graph-models. Programs (yes, software code), that perform tasks on behalf of the entities above or that operates as fully independent entities. Each of these nodes/entities can participate in transactions – or better, “value dances”. “Dance” because the protocol is multiplexing, not one-way request-response. 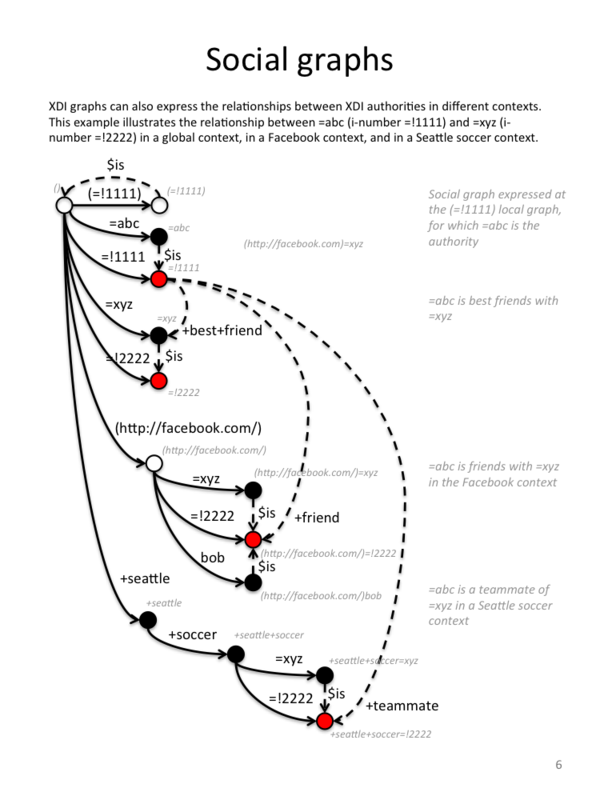 Of course all these entities will require identity, in the broadest sense, not only URI or ID number, but in the sense of a spectrum, a graph that can be shared in context with other nodes/entities. What we are witnessing is a 180° turn in the power balance between client and server, slave and master, buyer and supplier, consumer and merchant. But look at the subtitle: “When Customers Take Charge”. I like Doc a lot, but his subtitle may suggest that somebody else is in charge: the empowered customer. I am afraid that we may end-up with another un-balance, where the pendulum has swung the other side: where the customer has an unfair data-advantage versus the merchant. But let their be no doubt that today the merchant has the unfair data-advantage, and I read Doc’s book more like a plea for getting the balance right rather than a socialist rant against establishment represented by the “big boys”, the vendors, the merchants, the silos like Facebook and Google. But I would like to make the jump to truly balanced financial transactions and what “dances between equals” would mean in that space. I invite you to think about your bank as the merchant, the merchant of financial services, and the consumer as the retail or wholesale customer of the bank. In such scenario, the fundamental shift in thinking already happens at the Point of Sale (POS). We even have the question the term “Point of Sale”. It stems from an old thinking where the merchant “owns” the customer. YOU are the point of data integration! What if we start thinking about banking where YOU are the point of data-integration? What if your bank would offer you a service that enables you to manage your Personal Event Cloud? I don’t know how it would look like, but it probably would be something triggered from your mobile phone. It probably would look like one of the Next-Gen banks (Simple, Movenbank, Fidor) with a Personal Event Network out-of-the-box. Some of these Next-Gen banks are already accepting the CRED of your Social Graph as a much richer (in all senses of the word) basis for “Know you Customer”. Although we probably also have to inverse that: from the captive notion of “know your customer” to the user-centric meaning of “know your bank”. 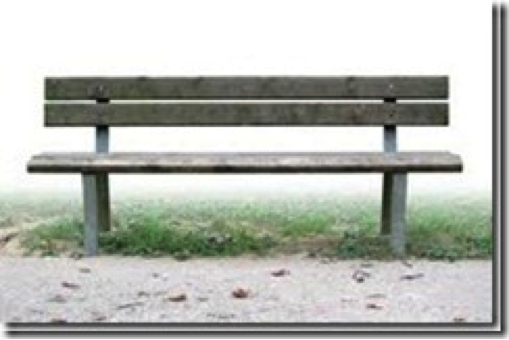 Then we may come back to the “primitive” of the meaning of “bank”: a bench where two people meet to build a relationship of value. So, the discussion is NOT about the next coolest thing for doing a copy-cat of existing money-transactions through the latest greatest gadget like NFC or Bump, or whatever. Also Christopher Carfi (@ccarfi) starts thinking in this direction in his recent post “Musings in Small Data”. In there, he refers to a video of Jerry Michalski (@jerrymichalski) of the REXpedition doing a demo his “Personal Brain”. (Disclosure: I am member of the REXpedition). The video is titled “Gardening My Brain” and the talk was given at Personal Digital Archiving on February 22, 2012 in San Francisco. It’s a pity that this talk is in the context of a personal digital archiving conference. Because, in my opinion, we have dramatically evolved from archiving to sharing. Sharing of information and digital assets is becoming the new normal in this world of Abundance of information. As these issues become more widely understood, more individuals will be tracking their own information. Perhaps it won’t be to the level that Jerry has done it in the video above, but it will be happening. This means that we, while wearing our business hats, will need to be developing real relationships with our customers. We need to listen to what they are saying, what they are asking for, and working collaboratively with them in order to help them fulfill their needs. In the best cases, we’ll have built up levels of trust with our customers and will have been given the explicit permission to access our customers’ personal data stores. In doing so, we’ll be able to actually take the guesswork out of the equation that was noted so clearly above in the Facebook example and will, instead, be able to connect directly with our customers’ intentions and deliver value on their terms. Creating an economy based on the principles of relations is of course at the heart of the REXpedition. It is probably the next territory for competitive advantage beyond the mundane money transaction. All this is about creating “Relationship Channels”, channels the vendor can tune into of the user has opened the channel. All the above are of course very much related to our Innotribe incubation project “Digital Asset Grid” (DAG), which is about the sharing of any digital asset with any party. All of the above is also very relevant to Mark Pesce’s (@mpesce) thinking about “hypereconomics”, described in one of my previous posts “The future rarely arrives when planned”. What those “irreducibles” are, you will be able to discover at our upcoming Innotribe event in Bangkok on 26-27 April 2012, where together with Mark Pesce we will have some great interactive learning experiences. Be there, or read the report that we will make on this post-conference. We are starting to see the emergence of “The universe as a Computer” as wonderfully described by Nova Spivack (@novaspivack) in one of his milestone posts last month. Generation M is more about what you do and who you are than when you were born. So the question is this: do you still belong to the 20th century – or the 21st? I would like to close with a reference to The Wellbeing Revolution (Amazon Associates Link) by James McWhinney (@JamesMcWhinney). What I liked about this book is that it encourages you to look at where you are in your life, and to look at it through the “M” lens. The lens of meaning. I then discover that what I am writing today, what job I am doing, who I am married to, was probably all meant to be this way. Not “meant” in a deterministic way. No, “meant” as everything I have done, the decisions I have made, my architecture studies, my infection by the identity virus, my journey in Leading By Being, etc… all these things have made me who I am. What if I could capture all this richness about me, and have a tool and an infrastructure to share that on my terms and conditions, in context, and with the parties or nodes in the grid that I choose to? What if I could share my meaning in a programmable way? By @petervan from the SWIFT Innotribe team.